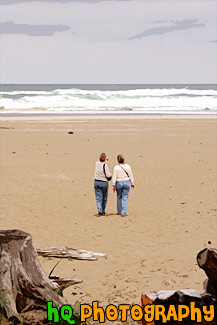 A scenic picture taken of two ladies walking towards the Pacific Ocean while on a beach located on the coast of Oregon State. This beach was located near Discovery Point, Oregon on a cloudy day. In the distance you can see the waves of the ocean and seagulls along the shore. 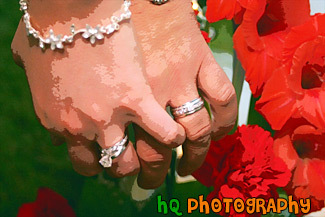 A scenic picutre taken close up of two newly wed's hands showing their wedding rings and red flowers in the background. A scenic close up picture taken of a newly wed's hands with their wedding rings showing. Each ring has many diamonds seen on it.